Ron Paul must be reading the News saying “I told ja! I told ja!”. Everything he said about The corruption of the Federal Reserve, it’s abandonment of the Gold standard, Its ‘Quantitative easing’ is all comming home to roost! The American Dollar is finnished! “When Vladimir Putin says the US is endangering the global economy by abusing it’s dollar monopoly, he’s not just talking. He’s betting on it. 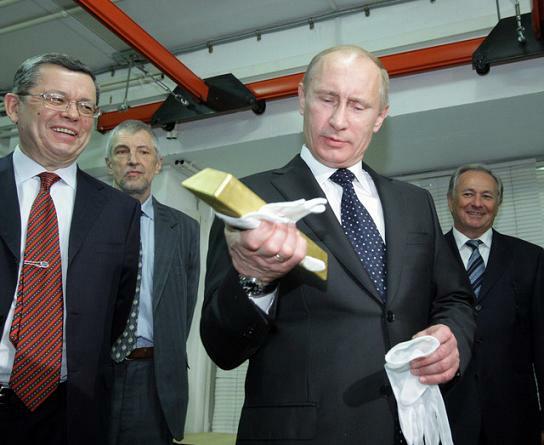 Not only has Putin made Russia the world’s largest oil producer, he’s also made it the biggest Gold buyer. Previous PostGet a free copy of ‘George Washington the Christian’.Next PostAtheism. Now with added reverence! Also, check out this website when you get a chance. It is THE BOMB. You guys must have some kind of anti-spam measure to defeat multiple URLs. Anyway, syndicated on my site, and you guys should check out the Awareness Act Social Network. The question of ‘How much gold does the US government hold’ is very difficult to determine. When you Google that question you can find Wikipedia links which suggest the US holds about 6000 tonnes, yet I have not been able to verify the actual existence of the gold, where it is held etc. There is every chance that Gold does not exist and that it is actually ‘Gold certificates’ which the US government possesses. Yet again it would be incredibly bad in the Military sense not to have a vast stash of gold to be able to finance the defense of your country in the event of economic collapse, and so you would expect there to be some War chest stash some where. I would imagine that the primary reason Putin is buying up Gold is for a War chest (rather than as a basis for Russian currency). I dont pretend to be an expert in these things. I merely express my observations and speculations. It also make you wonder how many pallets of Gold Bars (if any) New Zealand has stashed for military emergencies? 9 Silver or gold, what matters it? the Lord of hosts says. Both are mine! 1 and so, going into the dwelling, they found the child there, with his mother Mary, and fell down to worship him; and, opening their store of treasures, they offered him gifts, (of gold) and frankincense and myrrh.